Police have finally entered the charred epicenter of the scene, and 50 people were still missing as of early Tuesday morning. LAC-MEGANTIC, Quebec — Traumatized survivors of an oil train derailment that wiped out the heart of a small town braced for more bad news as inspectors were finally cleared to enter the charred site’s epicenter and look for remains late Monday, more than two days after the disaster that killed at least 13 people. A total of 50 were missing and the death toll was sure to rise. Quebec provincial police Sgt. Benoit Richard said eight more bodies had been found in the wreckage after firefighters doused the flames and cooled down some of the oil tankers that were in danger of exploding. Five bodies were found over the weekend, and police would not say where the newly discovered ones were, for fear of upsetting families. 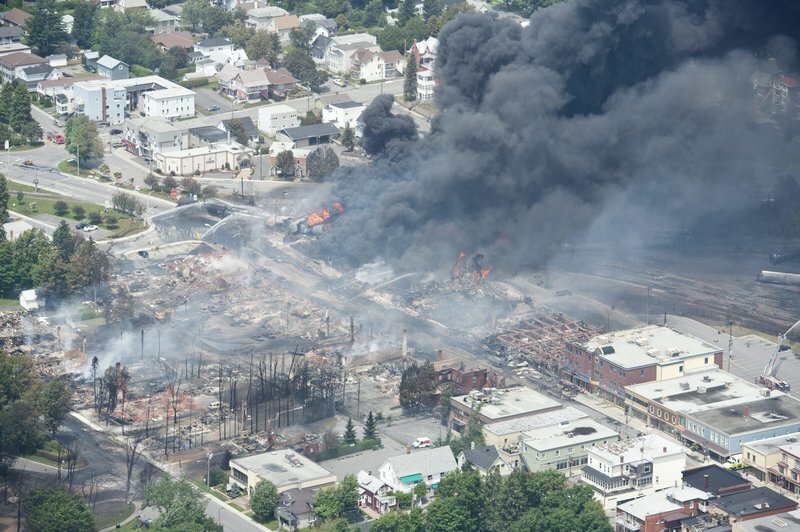 All but one of the train’s 73 tanker cars were carrying oil when they came loose early Saturday, sped downhill nearly seven miles (11 kilometers) into the town of Lac-Megantic, near the Maine border, and derailed. At least five of the cars exploded. Maude Verrault, a waitress at downtown’s Musi-Cafe, was outside smoking when she spotted the blazing train barreling toward her. “I’ve never seen a train moving so fast in my life, and I saw flames … Then someone screamed ‘the train is going to derail!’ and that’s when I ran,” Verrault said. She said she felt the heat scorch her back as she ran from the explosion, but was too terrified to look back. 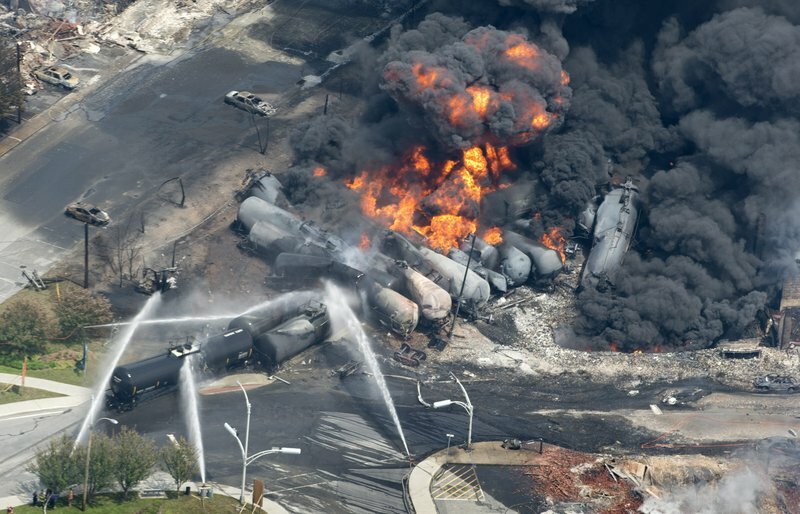 The rail tankers involved in the derailment are known as DOT-111 and have a history of puncturing during accidents, the lead Transportation Safety Board investigator told The Associated Press in a telephone interview late Monday. TSB investigator Donald Ross said Canada’s TSB has gone on record saying that it would like to see improvements on these tankers, though he acknowledged it’s too early to say whether a different or modified tanker would have avoided this weekend’s tragedy. The DOT-111 is a staple of the American freight rail fleet. But its flaws have been noted as far back as a 1991 safety study. Among other things, its steel shell is too thin to resist puncture in accidents, which almost guarantees the car will tear open in an accident, potentially spilling cargo that could catch fire, explode or contaminate the environment. “It’s too early to tell. There’s a lot of factors involved,” Ross said. “There’s a lot of energy here. The train came down on a fairly significant grade for 6.8 miles (10.9 kilometers) before it came into the town and did all the destruction it did.” He said the train was moving at 63 mph (101 kph) when it derailed. The Saturday blasts destroyed about 30 buildings, including a public library and Musi-Cafe, a popular bar that was filled with revelers, and forced about a third of the town’s 6000 residents from their homes. Much of the area where the bar once stood was burned to the ground. Burned-out car frames dotted the landscape. The derailment raised questions about the safety of Canada’s growing practice of transporting oil by train, and was sure to bolster arguments that a proposed oil pipeline running from Canada across the U.S. — one that Canadian officials badly want — would be safer. Raymond Lafontaine, whose son and two daughters-in-law were among the missing, said he was angry with what appeared to be lack of safety regulations. The fires sparked by the exploding tanks burned for two days, impeding investigators from reaching some of the “hot spots,” including the area near the destroyed Musi-Cafe. “It’s a zone that we’ve started to work on and we’ll work on it more in the hours to come,” Richard said. The area remained part of a criminal investigation and investigators were exploring all options, including the possibility that someone intentionally tampered with the train, Richard said. Canadian Transport Minister Denis Lebel said the train was inspected the day before the accident in Montreal and no deficiencies were found. Lebel defended his government against criticisms it had cut back on rail safety measures. He said the rail remains a safe way to transport goods the vast majority of the time. Earlier Monday, Queen Elizabeth II expressed deep sadness over the disaster, saying in a message through the federal government that the loss of life “has shocked us all.” Canadian Prime Minister Stephen Harper toured the town Sunday and compared it to a war zone. The train’s owners said they believed brake failure was to blame. “Somehow those brakes were released, and that’s what is going to be investigated,” Joe McGonigle, Montreal, Maine & Atlantic Railway’s vice president of marketing, told The Associated Press on Sunday. Officials were also looking at a locomotive blaze on the same train a few hours before the derailment. Ross also said the locomotive’s black box has been recovered, and investigators were looking into whether the air brakes or the hand break malfunctioned. Meanwhile, crews were working to contain 100,000 liters (27,000 gallons) of light crude that spilled from the tankers and made its way into nearby waterways. There were fears it could flow into the St. Lawrence River all the way to Quebec City. Quebec’s Environment Ministry Spokesman Eric Cardinal said officials remained hopeful they could contain more than 85 per cent of the spill. Local fire chief Denis Lauzon said firefighters in a nearby community were called to a locomotive blaze on the same train a few hours before the derailment. Lauzon said he could not provide additional details about that fire since it was in another jurisdiction. McGonigle confirmed that a fire was reported after the first engineer secured the train and went to a local hotel. “We know that one of our employees from our engineering department showed up at the same time to assist the fire department. Exactly what they did is being investigated so the engineer wasn’t the last man to touch that train, we know that, but we’re not sure what happened,” McGonigle said. The growing number of trains transporting crude oil in Canada and the United States had raised concerns of a major disaster. Harper, who has been pushing the Obama administration to approve the controversial Keystone XL oil pipeline from Canada to the U.S. Gulf Coast, has said railroad transit is more “environmentally challenging” than pipelines. The train’s oil was being transported from North Dakota’s Bakken oil region to a refinery in New Brunswick on Canada’s East Coast. Because of limited pipeline capacity in the Bakken region and in Canada, oil producers are increasingly using railroads to transport oil to refineries. Wayde Schafer, a North Dakota spokesman for the Sierra Club, has predicted such a catastrophe ever since crude began leaving the North Dakota by rail in 2008.